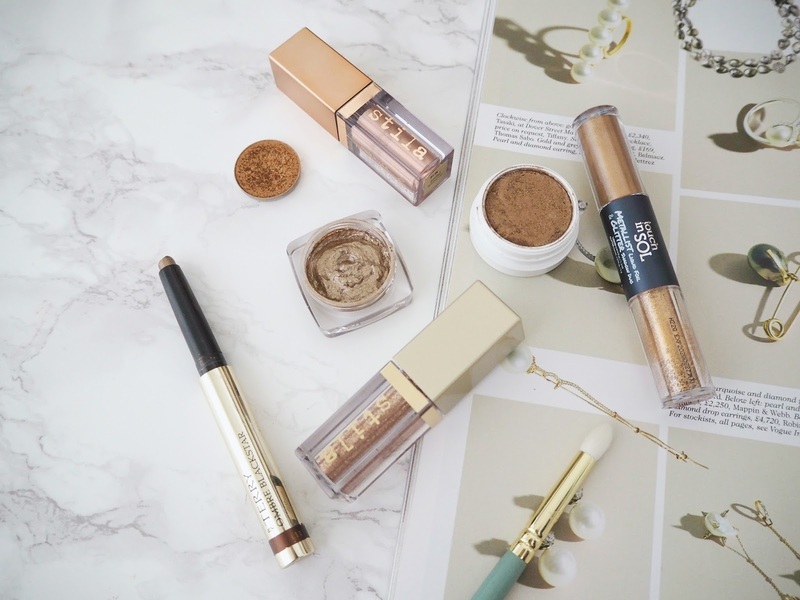 I love cream, foiled and liquid eyeshadows and today I'm talking through my favourites for creating a glam evening look with minimal effort in just a few seconds! You can apply most of these with your fingers and look like you put in way more effort than you did. You can add a bit of a matte crease colour in too if you want, but you can easily just apply one of these and go. Stila Magnificent Metals Shimmer & Glow Liquid Eyeshadow in Jezebel | £23 | I've done an entire post on this eyeshadow formula and the glitter version (which we'll get onto later) which you can check out here. It glides right on and is very opaque in finish and you can simply blend out the edges with your fingers. It then sets down after 10 seconds or so and it won't budge, crease or fade throughout the day. This has a pearly, metallic finish and is a beautiful rose gold colour with a slightly silvery shift to it. By Terry Ombre Blackstar in Bronze Moon | £29 | It's a pricey option but I use this so much that I don't feel too bad about the splurge! It has such a smooth texture and gives this beautifully dewy finish on the lids. It blends out easily using my fingers and sets into a budge-proof finish. As it's a crayon, you can also use it as a liner because it doesn't smudge. The finish means that this bronze-brown colour looks interesting and multifaceted on the lids. Makeup Geek Foiled Eyeshadow Pan in Legend | £7.95 | This is a powder eyeshadow formula but the texture is so smooth, it almost doesn't feel like one. It gives a liquid-metal look and is totally opaque. I find the wear-time of this to be fair - it's not as enduring as some of the creams and liquids in this post but I can trust it to hold up. Legend is a warm ambered gold colour. Touch in Sol Metallist Shadow Liquid Foil & Glitter Duo in Eldora* | £20 | This dual-ended eyeshadow is perfect for day-to-night makeup because one end has a soft sheeny cream eyeshadow and the other has this beautiful almost crushed metal-effect glitter. You can wear them individually or use the shimmer as a base and pat a bit of the glitter on the centre of the lid. I tend to just use my fingers to blend things out. It gives a stunning look on the lids that stays bold and crease-free even when you're having a late one! Eldora has a more muted antiqued gold on the liquid shimmer side and a warmer, more amber colour for the glitter. 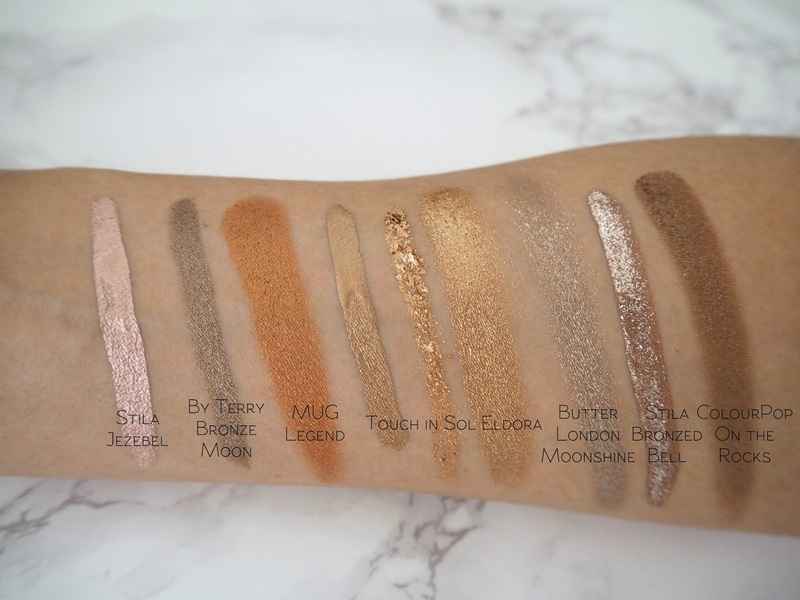 Butter London Glazen Eye Gloss in Moonstone | £15 | Grab these fast if you like the look of them because I think they're being discontinued, as they're reduced to £10 everywhere! I picked up this shade discounted as I love the formula so much but originally got Spark (check that out here). which seemed a little too similar to Eldora in colour to work for this post. These have a beautiful jelly-like formula that's super easy to swipe on and blend out. It has a wet-look finish with micro-glitter, which I used to be so against but really love for a night out these days. It's incredibly long-lasting and still looks fresh hours later. This is a sort of taupe-bronze colour. Stila Magnificent Metals Glitter & Glow Liquid Eyeshadow in Bronzed Bell | £23 | I think this is what got me into glitter because it's absolutely beautiful without being OTT. It comes in a liquid formula, so you can swipe it right on and blend out the edges with your fingers. It's an incredible, long-lasting copper colour with silvery glitter running through it. Colourpop Super Shock Shadow in On the Rocks | $5 | Sorry, this isn't available any more! However ColourPop often brings things back, so who knows...if they do, I'll definitely be getting a backup. I've linked their website anyway so you can have a browse of the many other shades available. This is a warm, rich brown with golden and iridescent micro glitter. It's one of my go-to products for an evening look in one swipe. It's a pretty bullet-proof formula so I use it when I need my eyeshadow to last a long time. 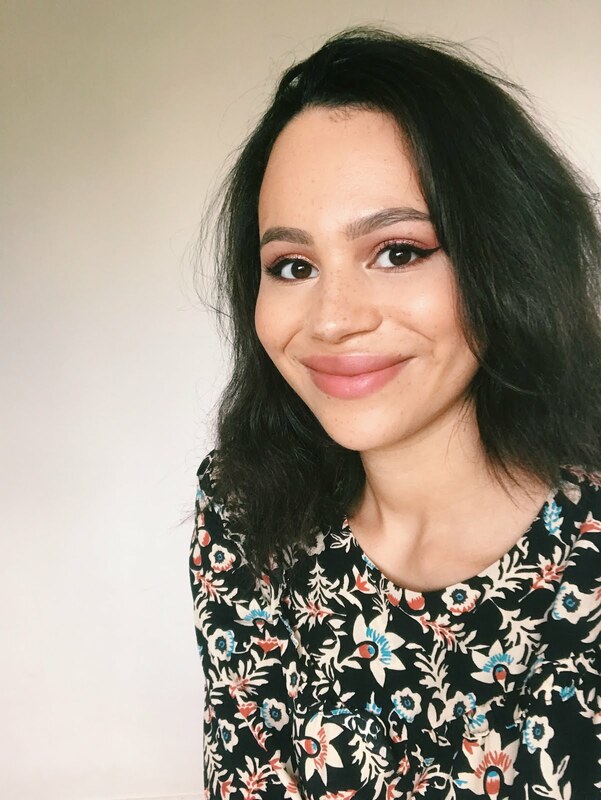 What are your favourite easy eyeshadows for a glam makeup look? Ah, these Stila liquid eyeshadows are so beautiful! These are some gorgeous looking shades here, I love them all. I still really need to try the shades from Stila, they look so pretty. The Stila eyeshadow is so amazing!!! Love it. I also love the Dose of Colors Shell Eye Duo, it is really easy to use and looks absolutely stunning. I'm so keen to try out those Stila liquid eye shadows, they look absolutely gorgeous! I love the Stila liquid eye shadows - we're using it in my wedding make-up look. I really love the look of the Butter London Eye Gloss too! The Stila Glitter and Glows are just beautiful! Jezebel is stunning. Didn't know On the Rocks was no longer available- I have it and it's one of my faves! Been too long since I've used it. The Ombre Blackstars are beautiful too and- as you say- so easy to use! The By Terry eyeshadow sticks are the best, I have one but I'd love to invest in a couple more shades. Totally worth the higher-end price. The Stila liquid eyeshadows are also gorgeous, although maybe more difficult to wear with daytime looks as it's so shiny and bright! 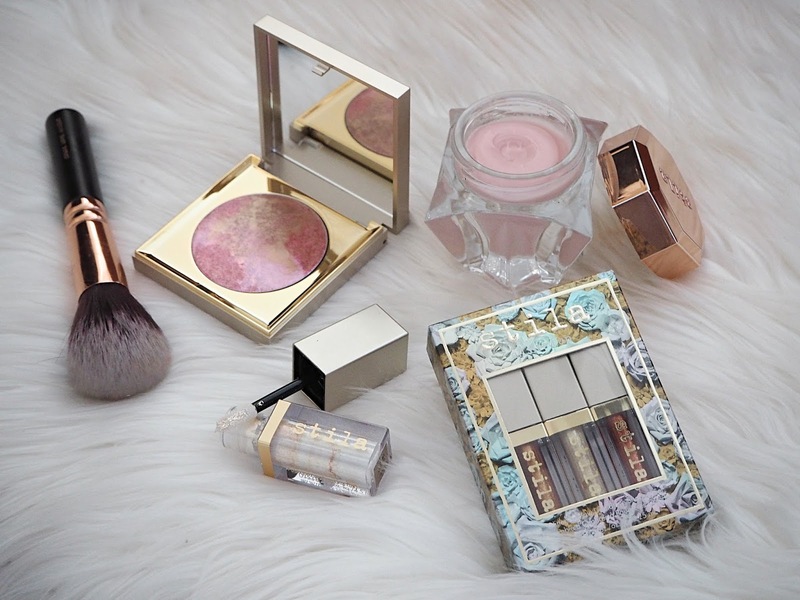 I really want to try the Stila shadow, they look absolutely beautiful! Stila ones look beautiful. I need to buy some already I feel like I am the only person left to have not tried them!